1985 - 30' Delta Sportsfishing flybridge , 240 HP 4LHA-STP Yanmar Diesel, 363 hrs on engine, 6 gal/hr fuel consumption, 150 gal fuel capacity. Twin Disc 1.5:1 transmission, Hynautic steering, Jabsco electric head, Nibral wheel with spare, 4210 Garmin GPS with 1000 HZ fishing transducer and Icom VHF. Atlantic fishing permits and fishing equipment available. 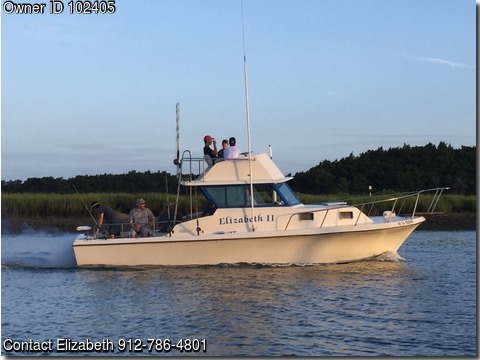 Well maintained, great charter boat. Call 912-786-4801 or fishtybee@comcast.net for more information.